Rhineland-Palatinate is a federal state located in the west of the republic with Mainz as capital. It has numerous tourist highlights to offer you. In order to explore these completely independently in any order, you should reserve yourselves a rental car through our portal and also save up to 60%. Rhineland-Palatinate has many places of interest which are worth exploring by renting a suitable car from us. One of these highlights is the German Wine Route, which starts a few kilometres south of Mainz, in Bockenheim at Worms . 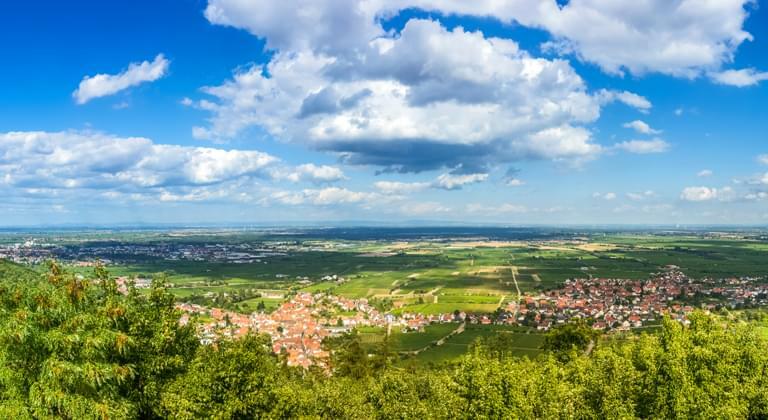 The beginning and end of the German Wine Route are each marked by an impressive wine gate, in between, the route runs 85 kilometres through the hilly landscape of the Vorderpfalz. The varied journey makes detours possible, for example to the Hambacher castle or to the Wachtenburg and lets you, at the correct season, become a witness of traditional wine celebrations. If you have taken over your rental car for example in Mainz, fascinating excursion destinations in every direction are available to you in option. In any case it is worthwhile to rent a car from us, because the federal state has first-class roads and motorways. If you drive with the rental car into the west of Rhineland Palatinate, to the Moselle, you are animated by numerous castles and palaces to the attendance. Special highlights here are the Reichsburg Cochem and the castle Eltz near Beilstein on the Moselle. An excursion by rental car from the state capital to the western border of Rhineland-Palatinate leads you to well-known sights like the Porta Nigra or the cathedral to Trier. The journey over the perfectly developed Hunsrück high road (B50) is an exciting experience and lasts with the rented car scarcely two hours.